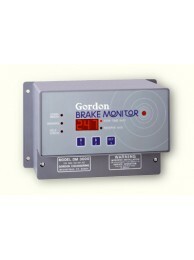 The DM3000 Brake Monitor is a device that monitors the stopping times on mechanical power presses. The components of the system are: a control unit and a motion detector. The stop time control unit interfaces electrically with the motion detector by means of the motion detector cable. The motion detector is mechanically connected to the crankshaft of the press by chain, belt or direct drive and generates an electrical signal whenever there is shaft movement. The brake solenoid voltage (which is removed to apply the brake on the press) is constantly monitored by the control unit. When the voltage is removed, a high precision digital counter is activated, which continues to count until the motion detector signal indicates all motion has ceased. The elapsed time is indicated on a 3-digit LED display on the face of the control unit. The brake monitor opens the control relay in the Stop Output circuit, which is used to remove power to the press, whenever the stop time of the press exceeds the preset limit. The Stop Output also features a safety relay with its contact wired in series with those of the control relay. This safety relay works in conjunction with an armature configuration in the control relay, which allows for detection of a welded relay contact and opens the Stop Output if a contact weld occurs. A separate adjustable Warning Output provides a means to alert personnel to the fact that stop times are approaching the alarm point - this feature warns of brake wear and helps eliminate unintended machine stops. The keypad allows the authorized user to alter the alarm and chain-break delay settings. A key-lock prevents unauthorized keypad entry. A self check circuit monitors the control. 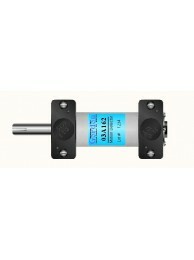 It operates continuously and is independent of machine cycle. In the event of a self-check fault, both the control and safety relays open and a fault code is displayed on the 3-digit LED. A chain-break detection circuit monitors the motion detector input and alarms the unit if the motion detector is either disconnected or fails to provide a signal. Features microprocessor-based electronics, 3-digit LED display for stop or reserve (time to alarm) times, auto-learn mode, continuous self-check circuitry, chain break monitor, and enhanced relay protection (includes welded contact detection).